Photoionization of many-electron atoms is of prime importance in controlled nuclear fusion. In a recent Journal of Physics B: Atomic, Molecular and Optical Physics article A Müller et al experimentally and theoretically study photoionization of Ta-like (W+) tungsten ions. Authors Professor Dr Alfred Müller and Dr Brendan McLaughlin explain more about their research below. Pure tungsten has the highest melting point (3695 K) of all metals. Due to its high chemical resistivity and physical robustness it has moved into the focus of research in the field of controlled nuclear fusion. Presently, it is envisaged as the most suitable plasma-facing material in high-power environments of future fusion devices such as ITER, the large international fusion reactor currently under construction at Cadarache, France. Tungsten atoms sputtered from surfaces and entering the plasma end up in high charge states but still retain at least ten to twelve electrons even in the hot reactor core. Due to large cross sections for atomic processes that generate electromagnetic radiation these ions emit photons and thereby cool the plasma – possibly to below burning conditions. Controlling such radiation losses requires detailed knowledge about atomic processes and spectroscopic properties of tungsten atoms and tungsten ions in almost all charge states. Beside its applied importance, tungsten is also of increasing scientific interest because of its many-body nature. Many-electron effects govern the properties of the matter that surrounds us. Understanding those effects in atoms and ions is the first step towards understanding the material world in which we live. The neutral tungsten atom in its ground-state configuration features 74 electrons, 68 of which fill all electron shells with principal quantum number n up to 4 and the s and p subshells with n=5. The 6 remaining electrons, rather than populating the next subshell, are distributed such that 4 reside in the 5d subshell and 2 in the 6s subshell. Obviously, there is strong correlation between the valence electrons in the outermost subshells and this electron-electron interaction determines the configuration and the electronic properties of the atom. In an experimental and theoretical effort the response of tungsten in low stages of ionization to irradiation with narrow-bandwidth UV and EUV photons has been studied (see A. Müller, S. Schippers, J. Hellhund, K. Holste, A. L. D. Kilcoyne, R. A. Phaneuf, C. P. Ballance and B. M. McLaughlin 2015 J. Phys. B: At. Mol. Opt. Phys. 48 235203 and B. M. McLaughlin, C. P. Ballance, S. Schippers, J. Hellhund, A. L. D. Kilcoyne, R. A. Phaneuf and A. Müller 2016 J. Phys. B: At. Mol. Opt. Phys. 49 065201). Experiments were conducted to measure absolute cross sections for single ionization of tungsten ions by single photons and large-scale ab-initio calculations were performed to test the suitability of present state-of-the-art theoretical models for describing electronic and photonic collisions of such multi-electron systems. Figure 1. Cross sections for photoionization of singly charged tungsten ions. The upper panel shows the experimental result. 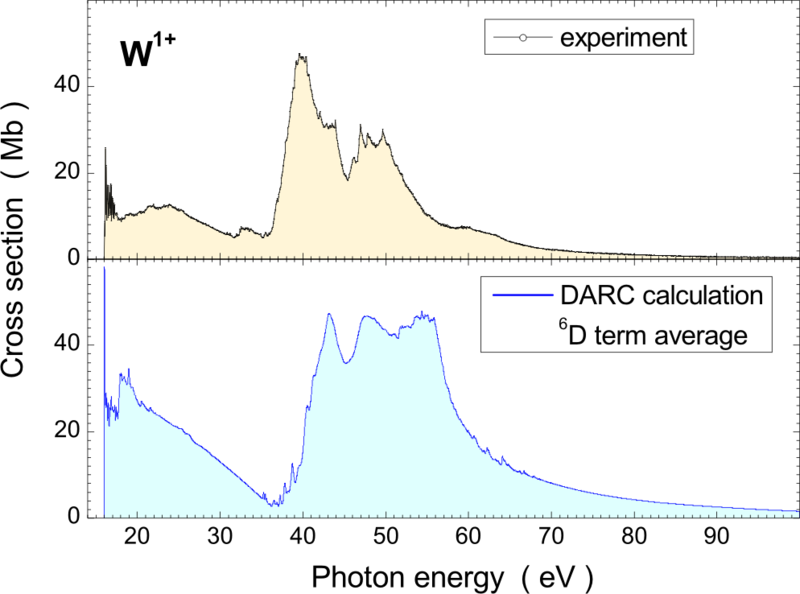 The lower panel displays the spectrum for the ground-state term of W1+ obtained by relativistic 573-level R-matrix calculations. Figure 2. Cross sections for photoionization of triply charged tungsten ions. The upper panel shows the experimental result. The lower panel displays the spectrum for the ground-state term of W3+ obtained by relativistic 379-level R-matrix calculations. In the experiments beams of tungsten ions were merged with beams of monochromatized synchrotron radiation and all ions that had lost one electron in a single-photon-isolated-ion interaction were recorded by a single-particle detector. By measuring all relevant quantities, which comprise the photon and ion fluxes as well as the overlap of the two beams, absolute cross sections for photoionization of the investigated tungsten ions could be determined. The theoretical work was based on a relativistic R-matrix approach characterized by wave-function representations with unprecedentedly large sets of basis states. 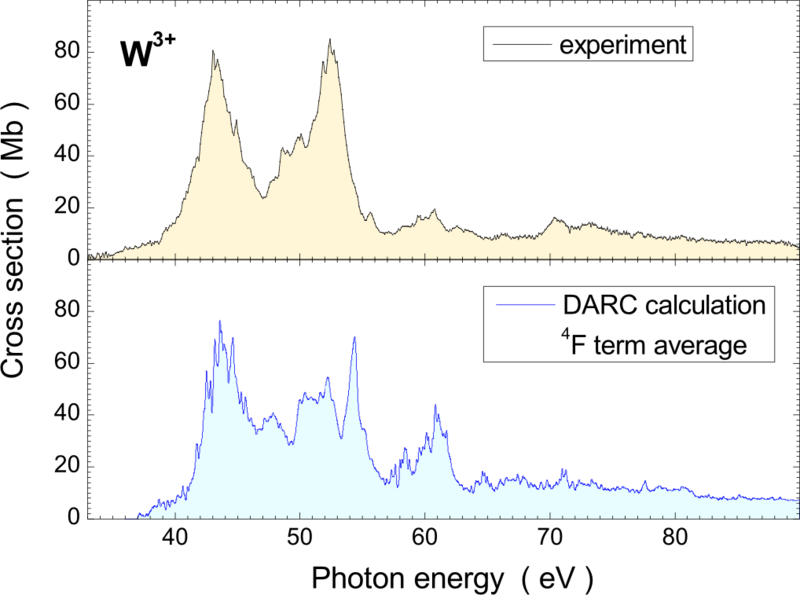 Using the massively parallelized DARC (Dirac–Coulomb R-matrix ) package of codes with hundreds of basis states and using the most powerful computational resources presently available worldwide the main features of the experimental cross sections could be reproduced, particularly the overall shape and size of the cross-section function. Comparisons of theory and experiment are complicated by the presence of long-lived excited ions in the primary mass-and-charge selected ion beams employed in the experiments. The studies performed along the isonuclear sequence of Wq+ ions with q=1,2,3 indicate increasingly better agreement of theory and experiment with increasing ion charge state q. The reason for this is in the representation of the wave functions by very large but still too limited sets of basis states of a size which can still be handled by using presently most advanced computational resources. With increasing charge state of the ions the electron-electron correlations whose description requires particularly large basis sets become less important relative to the electron-nucleus interactions and hence, the description of photoionization for ions with higher charge states gets relatively better with a given size of the basis set. Alfred Müller‘s professional interests comprise collisions between atomic particles (atoms, molecules, ions, electrons, photons) studied by using static gas targets or crossed-beams and merged-beams arrangements. The present experimental work was performed at the ion-photon beam (IPB) setup of the Advanced Light Source in Berkeley. Brendan McLaughlin‘s research interests are in the development of ab initio numerical methods for complex atomic and molecular systems in collisions with electrons and photons, non-adiabatic methods in heavy particle collisions and in atomic and molecular processes relevant to laboratory, x-ray, astrophysical plasmas, ultracold collisions and applied science. Figures and featured image taken from A Müller et al 2015 J. Phys. B: At. Mol. Opt. Phys. 48 235203 Image (c) IOP Publishing. All rights reserved. Author images used with permission, copyright Alfred Müller and Brendan McLaughlin respectively.